I love to make this Egg White Salad Recipe to have on hand for the week…it’s so filling and I can have it as a snack with crackers or on toast or salad for a lunch. Each 3/4 cup serving is just 2 Points, so it makes a great low calorie prepared food on hand when I don’t have the time or energy to cook something. This cholesterol free egg salad is made with Vegenaise which is my absolute favorite mayo alternative. But reduced fat mayo works just as fine too. Either way, this is one delicious egg white salad recipe that is key to help keeping you full for just a couple of Weight Watchers Points. Enjoy! An easy and delish alternative to traditional egg salad recipes, this healthier version is made from all egg whites and is incredibly flavorful and filing. Serve on whole wheat toast, on top of greens, or just eat it solo. 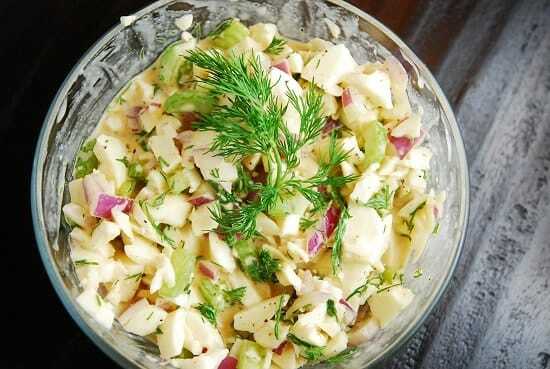 In a large bowl, combine egg whites, celery, red onion and dill. In a small bowl, mix together the reduced fat mayo, yogurt, lemon juice, mustards, paprika and salt & pepper. Fold mayo and yogurt mixture into the bowl with the egg whites using a rubber spatula. Add in additional salt and pepper as desired.